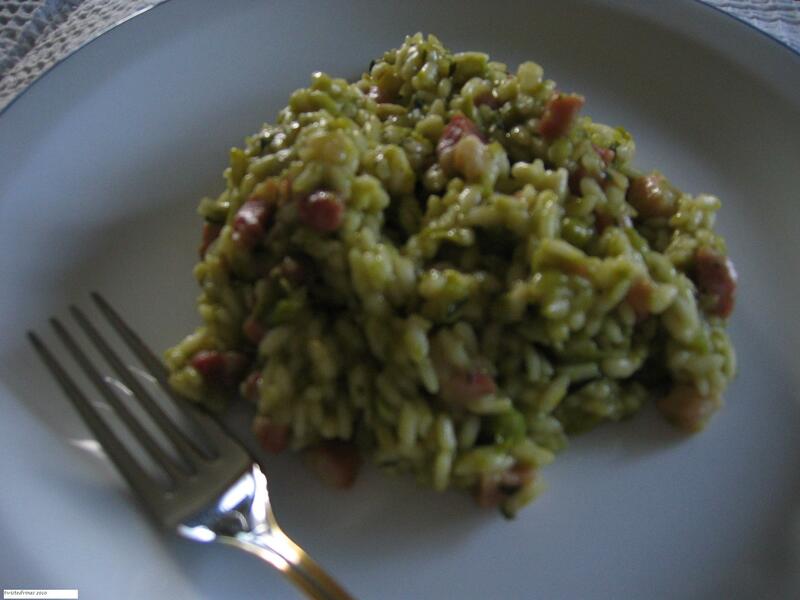 In the region Veneto, we have a large number of recipes with the base ingredient of rice. One of these favourite well-known recipes is Rice with Peas * i risi e bisi . Taking the opportunity at the fresh growers market I purchased two kilo’s of fresh peas. Having a few recipes in mind, my choice is this one. I know what you’re thinking, it’s just easier to buy a can of peas, or go to the freezer, but believe me there’s nothing quite like the taste of fresh peas. 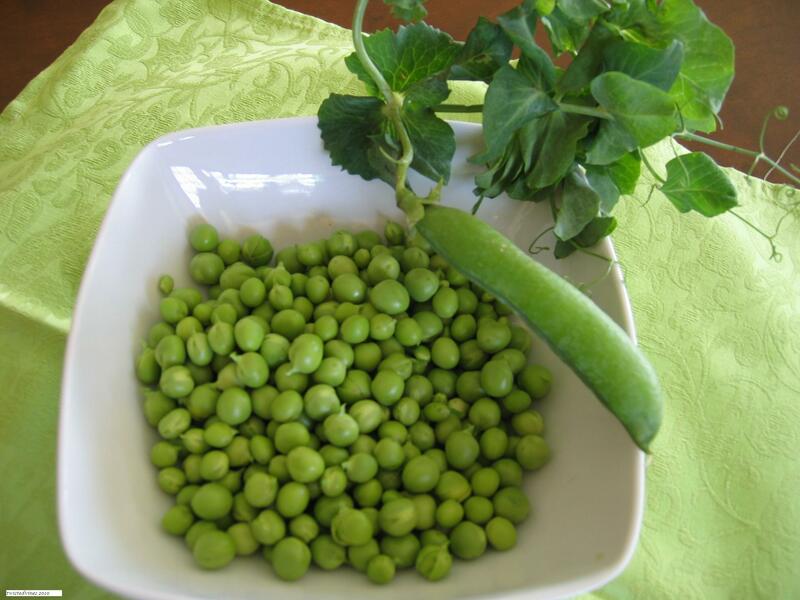 Let the senses glee with the sound of the crunch of the pea pod, the wonderful rich green colour, the perfume of fresh pearl peas, the taste and the silky glossy feel. I know I always think of my grandmothers shelling peas in the kitchen, but believe me they had it right, the fresh taste makes all the difference. This traditional plate is known to have been served to the Duke of Venice on the patron saints day of Saint Marks. The difference with this recipe apart from other risotto recipes is that the broth is added all at once. I use superfine carnaroli rice so cooking time maybe a little longer. 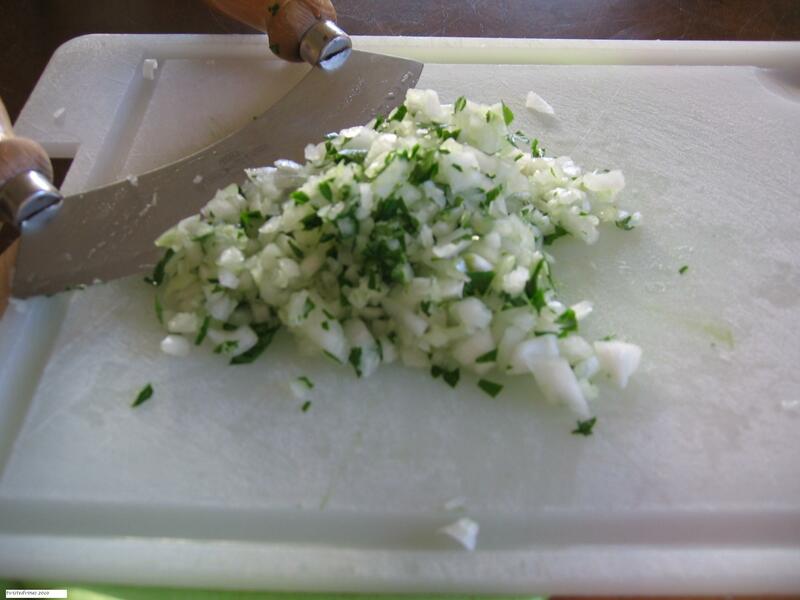 Chop very finely the white onion and parsley with the mezzaluna. Place 30 grams of butter and a dash of olive oil in a heavy base pan, by adding the olive oil the butter won’t burn. 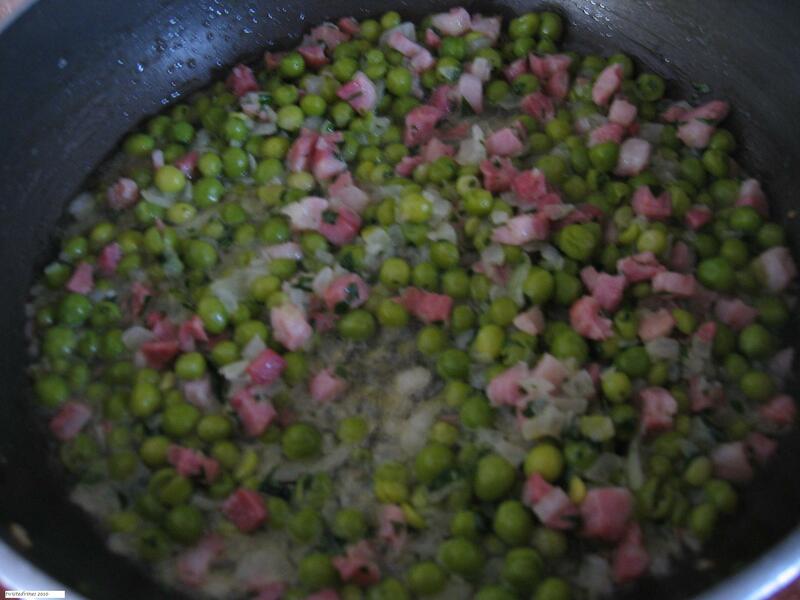 Cook until the onion is transparent, add the pancetta, cook until crunchy, add the peas, heat the vegetable stock and add a little to the pan, cover the pan with a lid and cook for 10 minutes. Never add cold water or stock to rice it stops the cooking process. Add the rice, continuously stirring, add 600 ml of vegetable broth, and continue stirring. Risotto isn’t one of those dishes you can leave to do something else, stirring is important. Here cooking time may vary, the rice I used took about 20 minutes. For this recipe the risotto shouldn’t be presented too dry, but remember we’re not making soup. At this point if you think the risotto is too dry add the remaining 100 ml of liquid. When the rice is cooked, turn off the heat, add the remaining 20 grams of butter, stir and let the risotto rest for a few minutes, if desired you can also add a spoonful of parmesan cheese. 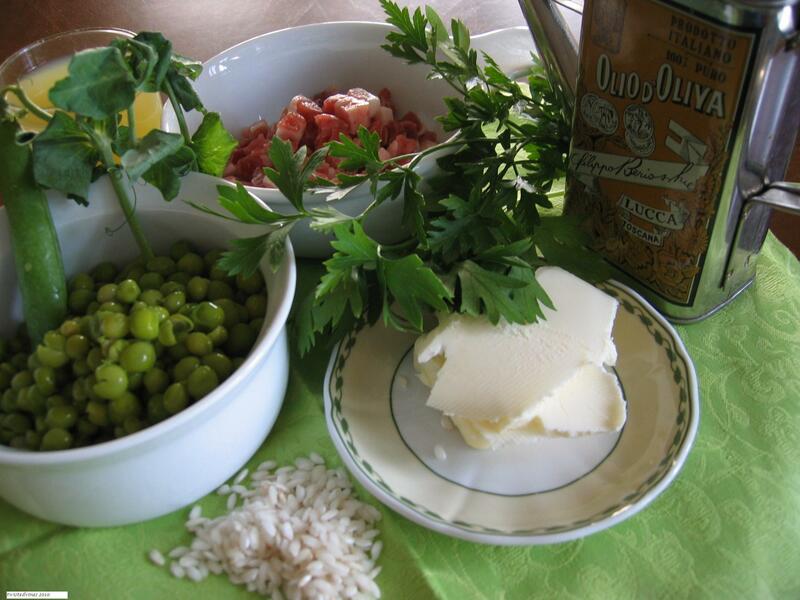 There you have it…Risotto..Venice style …i risi e bisi…the difference is the taste of fresh peas, so next time you see them at the market have a go at making this recipe…it’s fit for a Duke. It sounds really yummy. 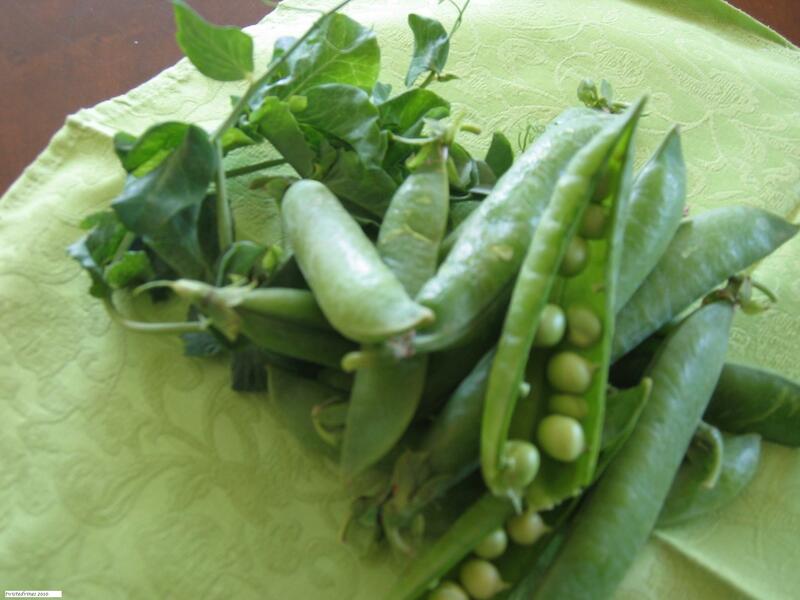 I love fresh pea, it’s so much better than frozen. I can’t wait to try it when I get some nice pea from the market.